Ash eruptions occurred on 3 and 15 November 1991, ejecting columns to a maximum of ~150 m above the crater rim. Since then, an average of 47 shallow earthquakes have been recorded monthly, and a white vapor column continued to rise to ~ 50 m above the crater. The Global Volcanism Program has no Weekly Reports available for Iliboleng. VSI reported that an ash eruption began on 17 November at 0615. The ash column rose ~ 1 km and was blown N, causing thin ashfalls on nearby villages. The eruption ended after several hours. As of mid-Jan, no additional activity had been reported. Press sources noted that the eruption was preceded by a moderately strong, felt earthquake on 15 November at about 2300. Information Contacts: A. Sudradjat and O. Mandraguna, VSI; M. Krafft, Cernay; SinarHarapan, Jakarta. Figure 1. Space Shuttle photograph (STS008-60-1840) taken on 31 August 1983 showing Iliboleng emitting a diffuse plume. Note that N is to the upper right; the plume is blowing almost due W. [Adonara Island covers 580 km2 and is 37 km long and 18 km wide. Lomblen Island, with its many volcanoes, is ESE of Adonara Island. To Adonara's west, the E tip of Flores Island is visible; almost due S of Adonara is Solor Island.] Courtesy of C. Wood. Information Contacts: C. Wood and R. Underwood, NASA, Houston. Iliboleng erupted on 28 May at 1735. A single explosion ejected incandescent material and caused ashfall on a nearby plantation and several villages both E and W of the summit (Lamalota, Dua Muda, Tuawolo, and Kiwangona). The incandescent ashfalls caused grass fires in the very dry area (no rain reported since February) that burned 700 hectares of grass W of the volcano and 250 hectares to the E. About 570 people were evacuated from several villages after the initial explosion and grass fires, but returned to their homes 31 May. On 2 June at 0500, weather had cleared and a white vapor cloud of ~100 m height was reported. B-type earthquakes were recorded in the area on 21 May, but no more seismic data were available. Iliboleng erupted on 18 July at 1234, ejecting a cloud to ~ 800 m above the summit. Explosions occurred 10, 15, and 24 November. A gas and ash column emitted on 24 November at 0712 reached 1,000 m height and was blown NNW, covering 18.7 km2 with ~1 mm of ash. There were no casualties. Shallow volcanic seismicity began 30 October, with as many as 60 events/day. Eruption tremor was recorded for 1.5 minutes on 10 November. Since 20 June, a plume has risen as much as 300 m above the summit. The number of shallow volcanic earthquakes increased to ~20/day 20-25 June, compared to 1/day previously. No eruptive activity has been reported since November. During July, white plumes continued to be emitted to 300 m above the peak. Several shallow volcanic earthquakes were recorded daily during early July. In late July, seismic activity had returned to low background levels. A large explosion occurred on 2 October at 2252, depositing a light dusting of ash on villages near the volcano. A large explosion on 2 October at 2252 deposited a light dusting of ash in about a 15 km2 area around the volcano. During the week of 9-15 October, white fume was continuously present above the crater, rising to heights of 300 m. During that week, about 13 tectonic and 11 volcanic events were recorded/day. In July, fumarole temperatures in the crater were 60-70°C. On 15 July, an MM II earthquake was felt. The number and types of earthquakes recorded were: 131 distant tectonic, three local tectonic, two volcanic A-type, and 144 volcanic B-type. The volcano's level of activity is slightly higher than normal. Vapor and ash were continuously emitted to 100-850 m height, beginning 8 May and continuing through June. Shallow volcanic earthquakes were recorded 15-25 times/week (figure 2), but no explosion earthquakes were recorded. Tectonic earthquakes averaged 14-24/week. Figure 2. Monthly number of earthquakes at Iliboleng, January 1990-May 1991. Courtesy of VSI. Iliboleng stratovolcano was constructed at the SE end of Adonara Island across a narrow strait from Lomblen Island. The volcano is capped by multiple, partially overlapping summit craters. Lava flows modify its profile, and a cone low on the SE flank, Balile, has also produced lava flows. Historical eruptions, first recorded in 1885, have consisted of moderate explosive activity, with lava flows accompanying only the 1888 eruption. There is no Deformation History data available for Iliboleng. There is no Emissions History data available for Iliboleng. Iliboleng volcano at the SE end of Adonara Island, east of Flores Island, is a symmetrical stratovolcano with many partially overlapping summit craters. Iliboleng is seen here from Bukit Tomu, north of the volcano. Explosive eruptions from the summit crater have been recorded since 1885. Only one historical eruption, in 1888, produced a lava flow. Photo by Willem Rohi, 1994 (Volcanological Survey of Indonesia). 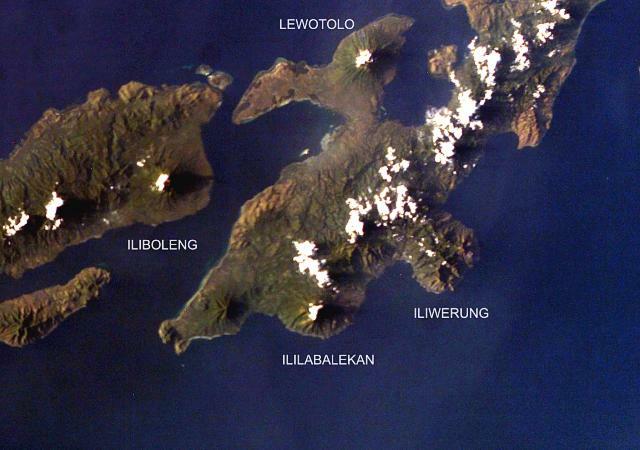 Iliboleng volcano rises above the Boleng strait between Adonara and Lomblen Islands, at the eastern end of the Lesser Sunda (Nusa Tenggara) Islands. The symmetrical volcano, which occupies the SE corner of Adonara, is seen here from the NE tip of the island. The 1659-m-high stratovolcano, the only historically active volcano on the island, is one of the most active in the Lesser Sundas. 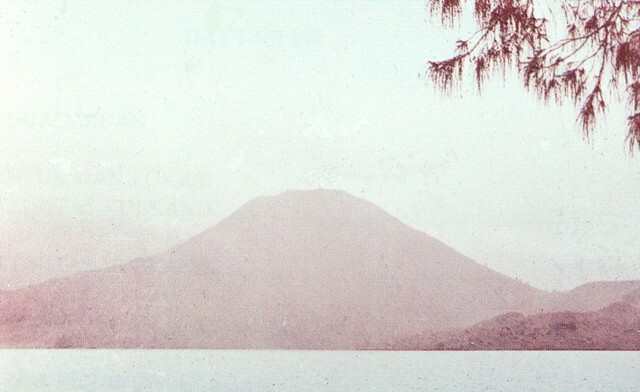 Photo by O. Rikman, 1985 (Volcanological Survey of Indonesia). 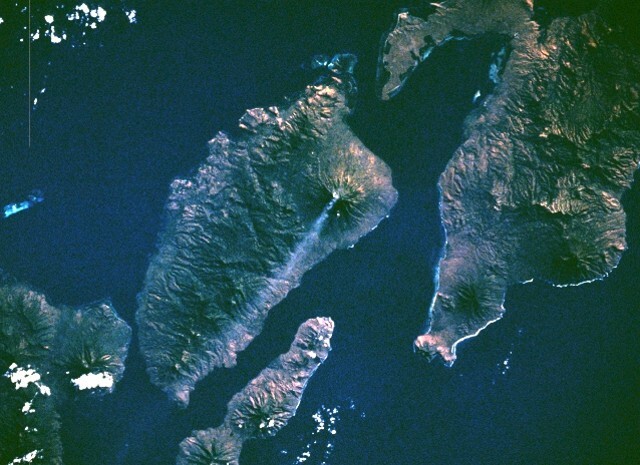 Four volcanoes are seen in this NASA Space Shuttle image (with north to the upper left) of Solor (lower left), Adonara (upper left), and Lembata (right) Islands. Ililabalekan volcano on SW Lembata (formerly Lomblen) Island is the only one of these without historical eruptions, although fumaroles are found near its summit. A satellitic cone was constructed on the SE flank of the steep-sided volcano, and four craters, one of which contains a lava dome and two small explosion pits, occur at the summit of Mount Labalekan. NASA Space Shuttle image ISS009-E-7480, 2004 (http://eol.jsc.nasa.gov/). An eruption at Iliboleng began on May 11, 1983, when thick black smoke rose to 500 m. Ash and incandescent ejecta was reported on July 13, fine ash occasionally fell from the plume on July 15. On September 4 space shuttle astronauts photographed this small diffuse plume 50-70 km long, and thick black smoke was reported again on September 22. A 500 m gray smoke plume was seen for a few minutes on November 24, and thick black smoke clouds (to max. 1 km) were emitted on January 3 and April 13, 1984. NASA Space Shuttle image STS008-50-1840, 1983 (http://eol.jsc.nasa.gov/). There are no samples for Iliboleng in the Smithsonian's NMNH Department of Mineral Sciences Rock and Ore collection. Large Eruptions of Iliboleng Information about large Quaternary eruptions (VEI >= 4) is cataloged in the Large Magnitude Explosive Volcanic Eruptions (LaMEVE) database of the Volcano Global Risk Identification and Analysis Project (VOGRIPA).